Drones are incredible tools for capturing photography & video from a totally different perspective. 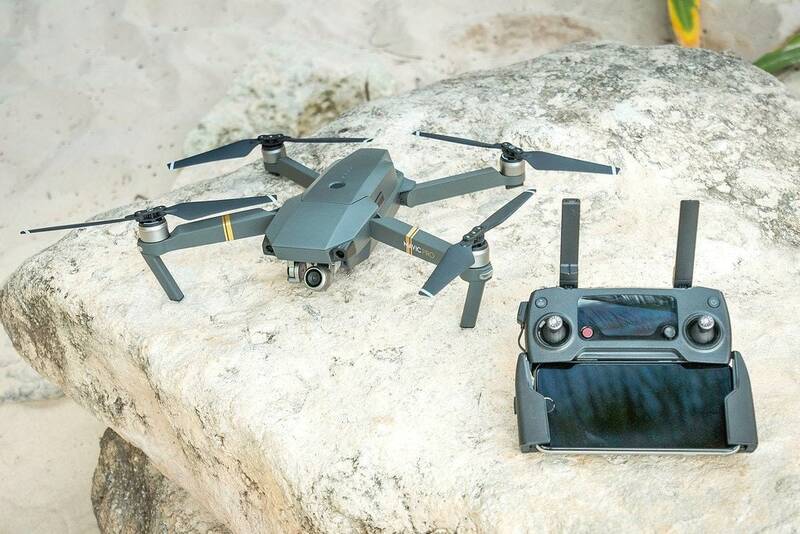 The new DJI Mavic 2 Pro boasts a very powerful camera in a small, travel-friendly package. It’s finally here! The perfect flying camera that travel photographers like me have been dreaming of. A drone that’s both small enough to fold up into a backpack, yet powerful enough to capture high-end images and pristine 4k video. 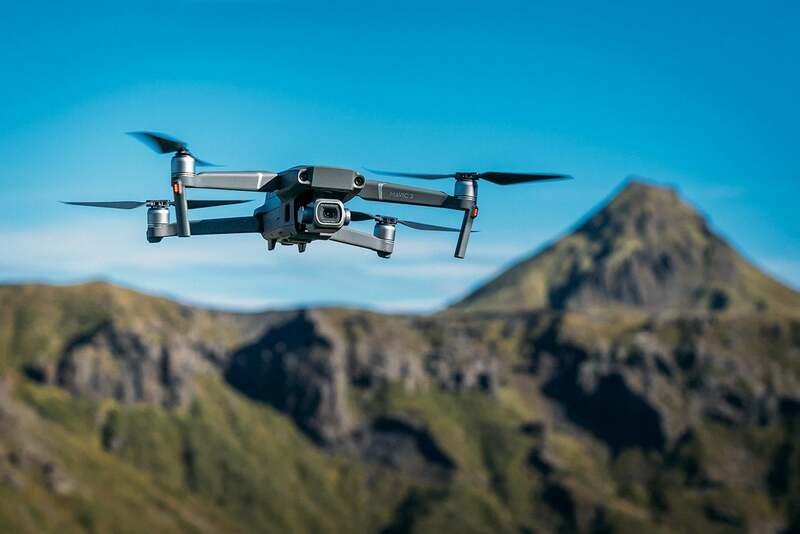 With the new Mavic 2 Pro, DJI has managed the impossible, sticking a giant 20mp, 1-inch sensor Hasselblad camera onto a compact drone full of high-tech sensors to avoid crashing into things. This new Mavic flies longer, faster, and farther than ever before too. 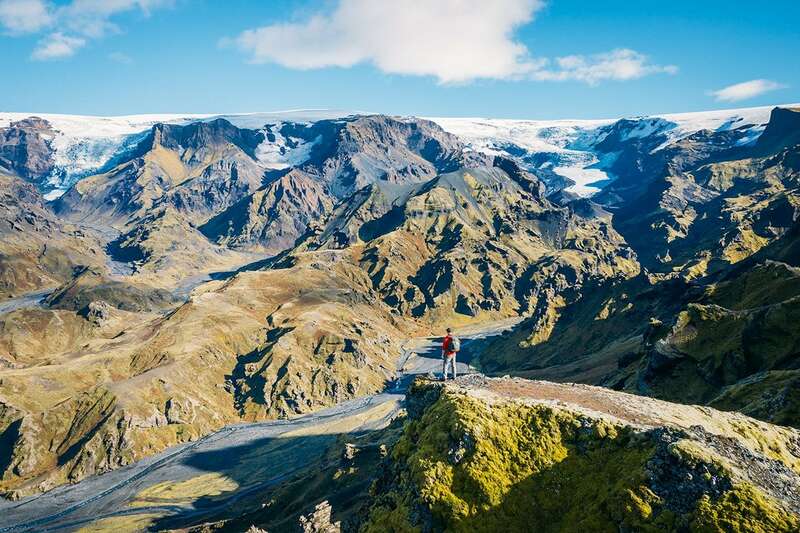 I spent a week in Iceland flying the Mavic 2 Pro around the Highlands, exploring beautiful canyons, driving through rivers, and hiking with it in the mountains. The Mavic 2 Pro has been improved in all sorts of ways over the original Mavic 1. The batteries are larger, resulting in longer flight time. The motors are bigger, allowing it to fly faster and power through strong winds. The gimbal is tougher, smoother, and the whole drone is more aerodynamic. But it’s the large square Hasselblad camera that really stands out. The Mavic 2 Pro comes equipped with a professional 1-inch camera sensor, just like the much larger Phantom 4 Pro, yet it’s over a pound lighter than the latter, and packs down MUCH smaller, to about the size of a Nalgene water bottle. Another big change with the Mavic 2 is its new omnidirectional obstacle sensing through the use of 10 different sensors that help you avoid obstacles in almost all directions. Sensors now look forward, backward, above, below, and to the sides — improving the drone’s ability to avoid crashing. With the release of the new Mavic, DJI decided to offer two different models. The Mavic 2 Pro, and the Mavic 2 Zoom. Each has their own special features, and price point, and deciding which is right for you really depends on your needs. The major difference between them is the ability of the Mavic 2 Zoom to “zoom in” in real time. From 24mm at the wide end to 48mm (2X crop). This is a nice feature for those who need it. For example, zooming in close to skyscrapers without needing to fly right next to them. Or zooming in on wildlife from farther away without scaring them off. The zoom feature also allows for a cool effect called the Dolly Zoom, made famous in classic horror movies. While the Mavic 2 Pro doesn’t have this ability to physically zoom the camera, it’s more professional due to the nicer Hasselblad camera, ability to shoot in 10-bit and a 4 times larger camera sensor. This means images it produces are higher-quality and have better detail in low-light. Plus, you can still produce some basic zoom-effects in post processing if you shoot in 4K. For me personally, having a higher quality camera was more important than the ability to zoom. It’s also why the Mavic 2 Pro is about $250 more expensive than the Zoom. The DJI Mavic 2 Pro is even easier to fly than the last one, if you can believe that. The remote control feels much more responsive, and you actually may want to turn down the sensitivity because it reacts so fast to your inputs. With even more obstacle avoiding sensors than the previous versions, you can fly with total confidence that you won’t crash into anything! Before you start flying for the first time though, I always recommend watching the Mavic 2 tutorial videos here. Then, practice flying in a large field. Drones sometimes feel like toys, but they really aren’t. They’re expensive flying machines that can do a lot of damage if you’re not careful! 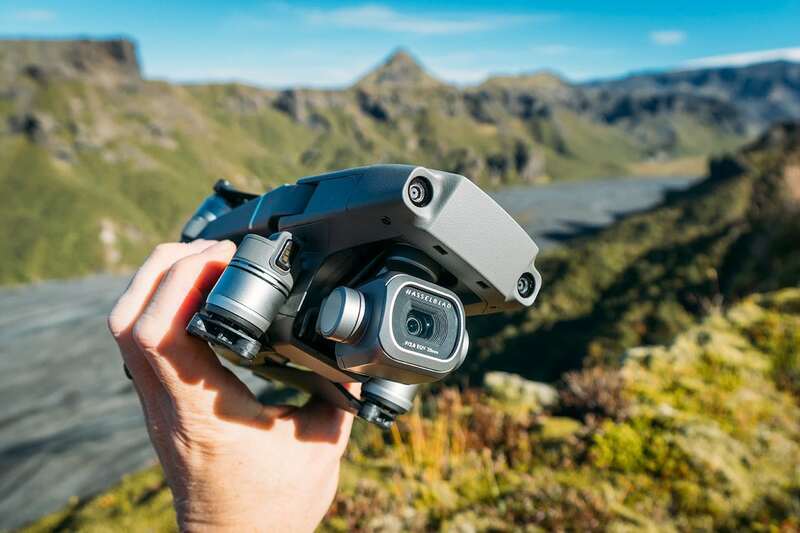 The Mavic 2 Pro comes equipped with a fancy new Hasselblad camera and large 1-inch sensor, giving it the ability to shoot incredible photos and video. This sensor is about 4X bigger than the Mavic 2 Zoom. The Mavic 2 Pro can also shoot 10-bit video, at a 100 mb/s bitrate. Without getting too technical here, basically, it records much more information for producing high-end video & photos. Battery life for the DJI Mavic 2 has improved, now able to fly for 31 minutes on a single charge (as opposed to 24 minutes on the Mavic 1). However, in real-world use, these times are a bit high. In my experience, the Mavic 2 Pro can fly for about 24 minutes before you need to land it safely (the original Mavic also had this quirk). I generally travel with 2-3 batteries to maximize my flight time in each location. It takes about 1.5 hours to recharge these larger batteries, and the charger itself now includes an integrated USB cable for the controller. Because it’s permanently attached, you can’t lose it. Very handy! If you’re looking to capture the most cinematic looking footage as possible, shooting in 4K at 24p will give you the best footage. The Mavic can now shoot something called H.265, which is a newer video codec that’s much more efficient. While this is definitely the future of video, H.264 is still easier for most computers to process. There are two versions of 4K to choose from, 4K Full FOV and 4K HQ. Basically, 4K HQ crop-zooms the 4K footage to a 40mm frame. 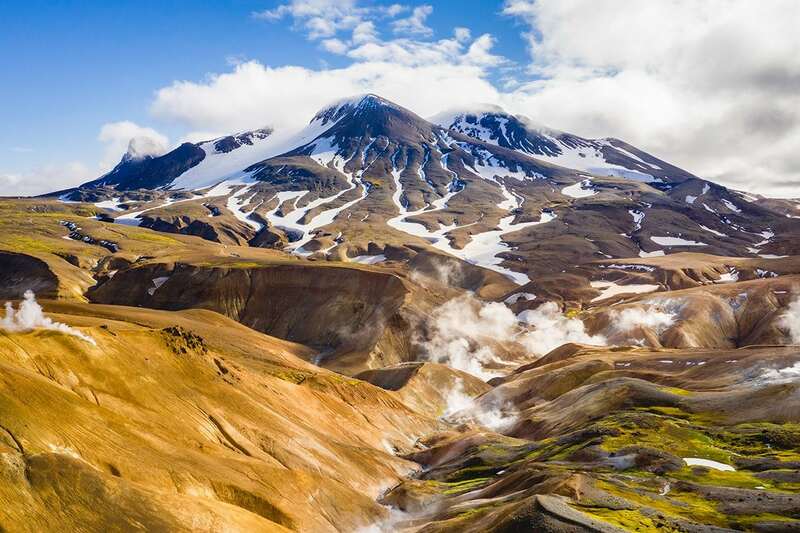 This can be nice for isolating a subject or compressing a big background to make it appear larger, like tall mountains. I recommend you set your white balance manually for video, rather than keeping it in auto, so the white balance doesn’t change while you’re filming. If you don’t color-grade your footage, the “Normal” color profile setting works great. However, if you use color grading techniques or LUTs with software like Color Finale, you’ll probably want the flat color profile called D-LOG M.
These are the settings I’ve found work best for me. One thing to keep in mind is that under the “Normal” camera profile, the Mavic shoots in 8-bit. However, when using the D-LOG M profile, it shoots in full 10-bit (many more colors possible). But D-LOG M footage straight out of the camera looks very bland (on purpose). You’ll need to bring back the color, contrast, and sharpness using editing software later. For more information on color grading, click here. One of the coolest features of the Mavic 2 Pro for travel photographers is the ability to manually change the camera’s aperture to adjust focus/light. Generally, camera lens focus can be a bit soft with wide-open apertures, like F/2.8. But they can also be a bit soft if the aperture is fully closed, at F/11. I typically try to keep the aperture between F/5.6 and F/8 for good sharp drone landscape photography on the Mavic 2 Pro. Of course, you can also shoot in RAW format with the Mavic, which helps save as much information as possible for flexibility in post-processing later. The Mavic 2 comes with all the standard intelligent flight modes, like “Point Of Interest”, “Cinematic”, and “Quick Shots”. Tripod Mode is no longer in here though, that has been moved to the side switch on the remote — a very nice change. Much quicker to access. Quick Shots tell the drone to fly complicated patterns that would be very difficult to do on your own without tons of flying experience, like flying perfect circles while also flying up and keeping a subject in frame. The Mavic 2 has a new and improved Active Track system, which is far easier to use. It can identify multiple subjects (vehicles, people, etc. ), and you simply click on the one you want to start tracking. Due to the increased number of sensors on the drone (there’s 10 now), it’s far better at maneuvering through tight spaces with obstacles above, below, to the sides, in front and behind it too. Active Track starts in “SAFE” mode, which limits its speed, however you can also turn this off. Just beware that obstacle avoidance won’t work at speeds over 26 mph. NOTE: The side sensors are not on all the time. They only turn on during Active Track, Tripod Mode, and Quick Shots. The Mavic 2 comes equipped with a new Advanced Pilot Assistance (APAS) Mode which uses the camera sensors to automatically fly around obstacles rather than stopping in front of them. Previously DJI drones would just stop when they encountered an obstacle, but the Mavic 2 is smart enough to find an alternate route and continue flying. The Mavic 2 also has a new mode called “Hyperlapse”. Basically, this shoots cool moving time-lapse video from the drone, with minimal work on your part. It does this by shooting multiple still photos over a set period of time while flying. You can let the drone process the video clip itself, or choose to save the still photos, edit them, and convert to a time-lapse video later. Just know that this process can take between 5-8 minutes for a 5-second video clip, so it will drain a good chunk of your battery (around 30%). 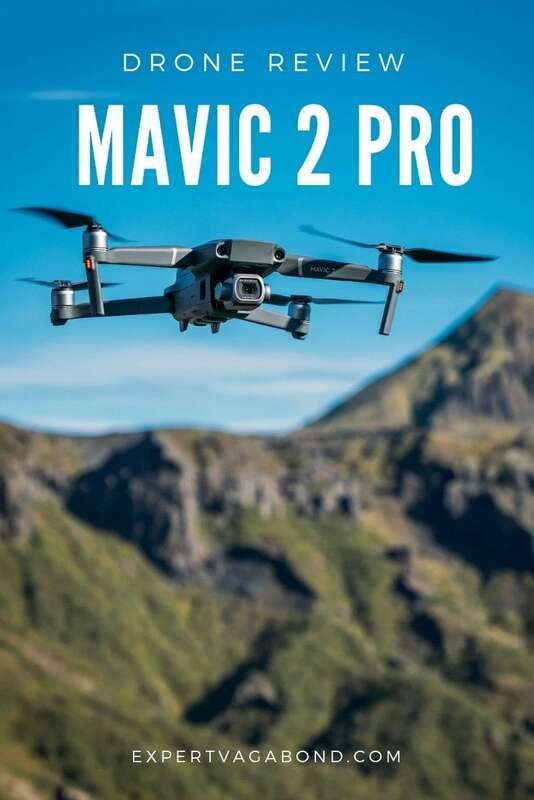 There are a few more differences between the Mavic 2 Pro and the original Mavic 1. The Mavic 2 now includes 8GB of internal storage, just in case you forget your memory card. While the Mavic 2 Pro is about the same physical size as the Mavic 1, it’s about half a pound heavier due to the larger batteries, additional sensors, and a bigger camera. The new camera cover on the Mavic 2 has a built-in gimbal clamp now. There are fewer pieces to lose, and it’s a bit quicker to put on/take off. The DJI Mavic 2 remote controller is pretty slick, displaying flight details like speed, altitude, distance, and battery level. You can switch your phone into full-screen mode (swipe up on iPhones), removing the information overlay so you can concentrate on framing your shots. Racing around at 45mph in sport mode is fun as hell, but doesn’t always make great video footage. The best drone shots are smooth and steady. Small input changes can have a big effect — you don’t need to jam down on the control sticks full throttle. You can always speed things up later in post. Why engage return to home when I can fly back myself? Well, the software is much more efficient than humans are. It takes the shortest path back, flying at optimal speed, saving you precious battery power. If you really want to land yourself, you can cancel it at the last minute and take control. If I’m attempting to fly from uneven ground (rocks, tall grass, sand) I generally launch the Mavic 2 Pro from my camera backpack, and catch-land it in my hand. However, I don’t recommend catch-landing until you have experience flying in all kinds of situations/weather. It can be dangerous if it goes wrong. Everyone crashes their drone eventually. Everyone. I’ve crashed a drone twice now, once in water! If you crash, look for the “Find My Drone” feature that shows its last location via GPS, and you can even force the drone to beep at you. Did you know you can broadcast live video from your DJI Mavic 2 to Facebook & YouTube? The video feed comes from the drone, while the audio comes from your phone. This lets you tell a story, or describe what you’re seeing, as you fly the drone live. 3G signals can work, but wifi or 4G connections are best. The DJI Mavic Sun Hood helps you see your phone’s screen in full-on sunlight, cutting out the glare. Especially if your eyes are sensitive to the sun. The DJI Mavic Car Charger can plug into a vehicle’s cigarette lighter and charge your battery while driving. Super helpful during travel photography road trips, so you always have fresh batteries. These Mavic ND Filters are a bit like sunglasses for your drone. It gives professional videographers the ability to shoot video at slower shutter speeds in bright sunlight, creating a more cinematic look. Like I said earlier, everyone crashes their drone eventually. It’s best to be prepared and purchase the DJI Care Refresh insurance, so when you do crash one day, you can get back to flying as soon as possible at minimal cost. 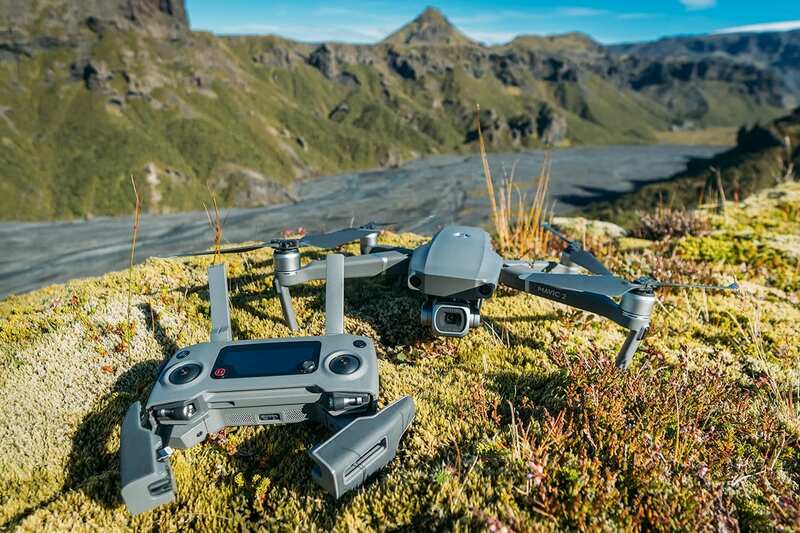 The DJI Mavic 2 Pro is the perfect drone for a travel photographer. Its high-end camera combined with a portable, folding frame, make it ideal for creating professional images & video on the road. It’s super easy to pack this drone with you for hiking in the mountains, snowboarding, out on a boat, or any adventure you can dream up. The Mavic 2 is just an all-around better drone. Faster, stronger, smoother, and quieter, plus more intelligent than the previous generation too. Win My Old DJI Mavic 1! Congratulations! That was a long post, and to reward you for making it down this far, I’m giving one lucky reader my older DJI Mavic Pro 1 to use on your next travel adventure! I loved the original Mavic, and traveled with it everywhere. It’s great for capturing unique video footage and photos from the sky when you travel. Here’s your chance to win it! Congratulations Delaney & Eduardo from Caravan Spirits! You’ve won the DJI Mavic! Happy flying! Have any questions about the DJI Mavic 2 Pro drone? Are you thinking of getting one? Drop me a message in the comments below! 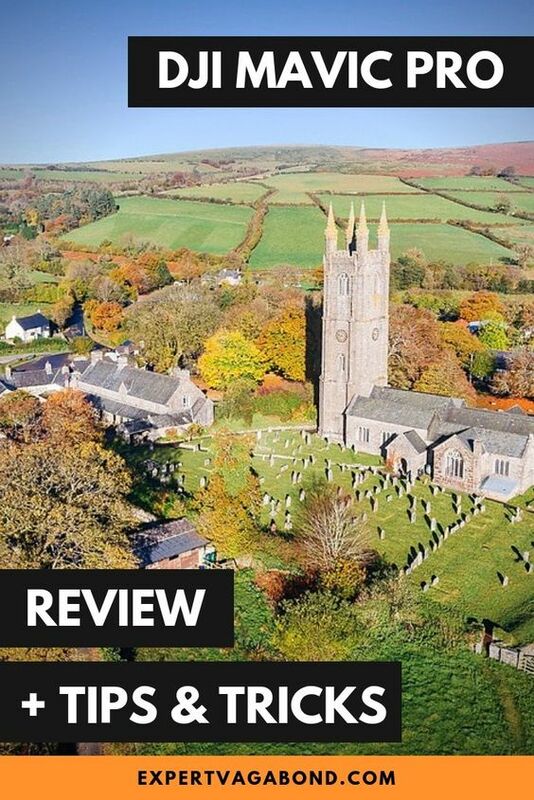 Thank you for your great review on the mavic 2 pro. I was curious which phone do you use with. Do you use any tablet or phone mount or directly your phone in the controler. I’ve been flying drones now for about a year and I simply love them. I would more than love do you have the Maverick Pro. The Mavic Pro 2 is a great travel drone. DJI really revamped the whole market with their introduction of such compact drones… I remember lugging my Phantom through Airports & up mountains… What a pain! But this little guy doesn’t look like some elaborate drug smuggling contraption & doesn’t need a special bag that is a pain to carry around. This looks like a great item I didn’t know that I needed but now I want. What an outstanding Giveaway! The Mavic1 would be a great gift for my husband. The demonstration video was very informative. You did an excellent job of explaining and operating in the video. Thanks for having such a great giveaway. Drones are getting nicer and more sophisticated. I would love to have one!